Inspector General of Police (IGP) Mohammed Adamu has ordered the decentralisation of the Special Anti-Robbery Squad (SARS). With the action, state commissioners of police are now to assume full command and control on all SARS departments in their various commands. The IGP has also announced the disbandment of the Special Investigation Panel (SIP) and Special Tactical Squad (STS), and other investigation teams. Adamu, gave the order during his maiden meeting with senior officers from the rank of commissioners of police which held at the police force headquarters in Abuja. 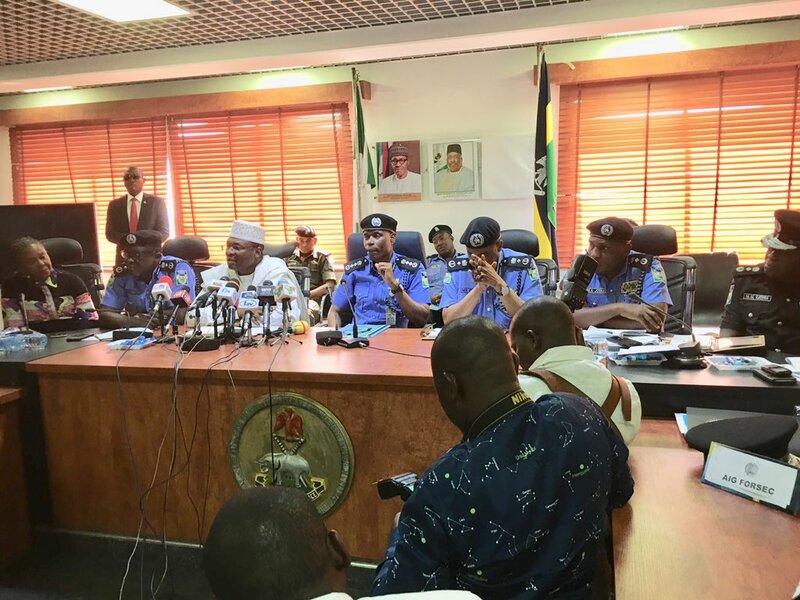 The IGP, who is meeting the commissioners for the first time since he assumed duty, also announced the setting up of a Special Election Investigation Teams (SEIT), to ensure electoral offenders are brought to justice. He said the team would work with the Independent National Electoral Commission (INEC) to promptly process the case files of the offenders for quick prosecution. The IGP, while reiterating the determination of the police to deal decisively with anyone who tries to cause trouble during and after the general elections, said the meeting was aimed at evaluating police performance in previous electoral engagements with a view to drawing lessons, ascertaining performance gaps and identifying critical operational challenges that can be addressed in the process of planning for the upcoming general elections. According to him, “the second purpose of this conference is to undertake national security threat analysis and level of preparation for the elections at the state command levels, discuss limitations and evaluate strategies towards managing the identified threats. “The third and perhaps most important is to enable professional interaction between the police, INEC leadership, and strategic partners across the country with a view to perfecting interventions that will aid in the attainment of our election security mandate as the lead agency in the election security management process. He said “the credibility of any election is determined not just by the legal framework regulating it and the conduct of the actors within the process but by the extent of professionalism and operational competence displayed by the police. Conscious of this reality, I assure the nation and the international community that the Nigeria Police Force shall coordinate effectively with other complementary security agencies, and collaborate efficiently with the leadership of the Independent National Electoral Commission in guaranteeing a safe and secure space for the citizens to freely exercise their electoral franchise. “This meeting shall task all commissioners of police across all the 36 police state commands and the FCT to galvanise their personnel and mobilise logistics towards ensuring a peaceful and credible outcome of the general elections. “Let me reiterate that while the police in all commands will secure law-abiding political actors, party faithful and citizens in the course of the elections, nobody should be in doubt as to the capacity and renewed determination of the police to deal decisively with elements that attempt to test our will by engaging in political violence or other electoral offences including vote buying which could threaten our democratic values. Any citizen that intends to offer himself or herself to be used negatively as cannon folders for political actors should either have a rethink or be ready to face the consequences. “Indeed, in order to ensure that such offenders are conclusively brought to justice, the DIG FCIID has been directed to set up Special Election Investigation Teams (SEIT) that will be tasked with the exclusive functions of taking in custody and undertaking detailed investigation of all arrested electoral offenders across the country. The teams shall also liaise with the Independent National Electoral Commission towards the prompt processing of the case files of the offenders for prosecution. “As promised during the handing and taking over ceremony between the immediate past Inspector General of Police and myself, a number of well-thought-out reform initiatives directed at restoring the traditional policing standards of the force shall be vigorously pursued in all aspects of policing functions, particularly in the operations, intelligence, investigation, training, science, technology and innovation (STI) and monitoring and evaluation within the force. “This is in cognisance of the fact that our responsibility as a police force is to operate within extant rules and best international policing practices. It also imposes on us, the obligation of respecting, protecting and advancing the rights of all citizens of this country regardless of their socio-economic status. “Furthermore, public acceptance of the police under a democratic setting is not influenced exclusively by the number of crimes that are solved but by the manner such are attained. Since no police force ever succeeds by alienating its citizens, we are firmly resolved that, under my watch, policing will be citizens-centred, rules-driven, and accountability-guided. “Towards this end, a comprehensive reform both in terms of ethics, mode of operation, nomenclature and orientation, function delineation, command and control, weaponry, and accountability mechanism will be undertaken in SARS. This is with a view to giving full, clear, measurable and accountable intervention to the presidential directives on reform and re-orientation of the unit as recently handed down to the force leadership. “A reorganisation proposal to this effect is being currently studied preparatory to its implementation. “At the end, a protocol that will document the outcome of the reform shall be developed. The protocol shall become the Standard Operating Procedure of the unit which will be engaged for performance evaluation in aid of accountability process and disciplinary concerns. It shall also act as guide for the review of specific operations involving the unit with a view to drawing lessons and identifying gaps which can be bridged in order to strengthen the operational engagements of the unit across all commands. “This initiative will be undertaken in close collaboration with the Presidency, Office of the National Security Adviser, Ministry of Interior, Police Service Commission and Human Rights Groups, Development Partners and other strategic stakeholders. The proposed re-organisation will produce a new Special Anti-Robbery Unit which will be professional enough to protect the citizens in their line of duty, but uniquely potent enough to respond to any major weapon-related organised crimes in the swiftest and most ethical manner. “While this initiative is being perfected, the operations of SARS which are currently centralised at the force headquarters are hereby decentralised. Consequently, with immediate effect, the commissioners of police in each of the 36 police commands and the FCT are to assume full command and control authority on all SARS in their commands, while the FHQ Unit is, henceforth, subsumed under the command of the DIG FCIID. The import of this is that the DIG FCIID and command CPs shall from this date, not only assume administrative and operational control of SARS in their respective commands, they shall also be directly held liable for any professional misconducts resulting from the operations of the units in their commands. Consequently, they are to immediately undertake a detailed evaluation of the units in their commands and submit a report to my office within the next two weeks. “Similarly, all quasi-investigation and operations outfits including the Special Investigation Panel (SIP) and Special Tactical Squad (STS) or any other such teams under whatever name are hereby disbanded. The DIG FCIID is to takeover and review all cases that such teams are currently handling as well as official assets in their charge and submit a detailed report to my office within two weeks. Similar comprehensive reorganisation will be undertaken in the investigative, intelligence and special operations arms of the force comprising of the Police Mobile Force, Counterterrorism Unit and the Special Protection Unit. “This re-positioning process will eventually cascade down to the zonal and state command levels. The essence is to restore order and apply a break to the current slide in policing standards, discourage the proliferation of multiplicity of outfits competing for operational space in the most unprofessional manner. We shall enhance the capacity of the force towards situating our operations within the principles and practice of Intelligence-led policing and human rights standards, and align our operations to modern dynamics.